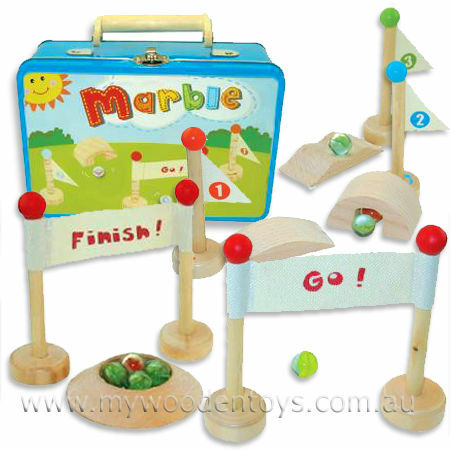 Marble Game Tin Case Playset this set is a lovely twist on the traditional game of marbles. This set comes in a colourful tin case with a wooden handle. There are a number of wooden pieces consisting of ramps, flags, bridges and more. the idea is to set out a course and get your marbles around it by flicking, blowing or by whatever means you decide. This is a fun game for any number of players and is wonderful for fine motor skills. We like this because:"Fun creative game in a handy carry case."